As a Harry Potter fan, you've probably dreamed of doing a lot of things from the book. You've wanted to explore the castle with all of it's moving staircases, talking painting, and even the mostly friendly ghosts. The classes seemed amazing, learning the ins and outs of spell casting, transfiguration, and potion making, despite Snape's moody disposition. And didn't J.K. Rowling make the trips to Hogsmeade seem absolutely magical? In the metaphorical sense of the word, that is! After literally living at school for weeks on end, it would be so much fun to taste the wares at Honeydukes and shuffle through the delights at Zonko's! An essential for that trip? A wizardly coin purse that can safely fit in the pocket of an invisibility cloak! This pouch will be the perfect detail to your wizarding ware! It is four inches in diameter, allowing plenty of coin inside without taking up to much room in any bag. The layered Hedwig bag is made from faux leather and has a clamshell clasp for an easy yet secure opening. While you probably haven't had any special deliveries by owl lately, that doesn't mean you can't have a little more magic in your everyday life! 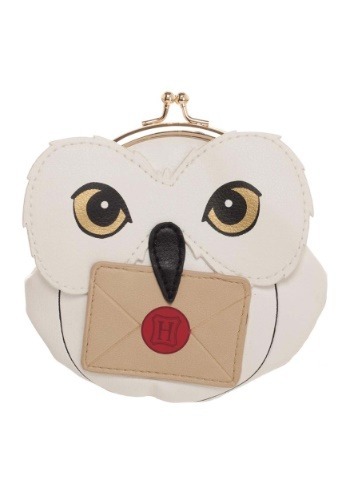 After you cast aside your wizarding robes for your day-to-day wear, you can still use this little coin purse. With gold eyes and white and cream colors, it's easy to make buying that latte just a little more charming.